Prep your deck for warm weather enjoyment with the cleaner tailored to its materials as well as the type of dirt and gunk it tends to get. 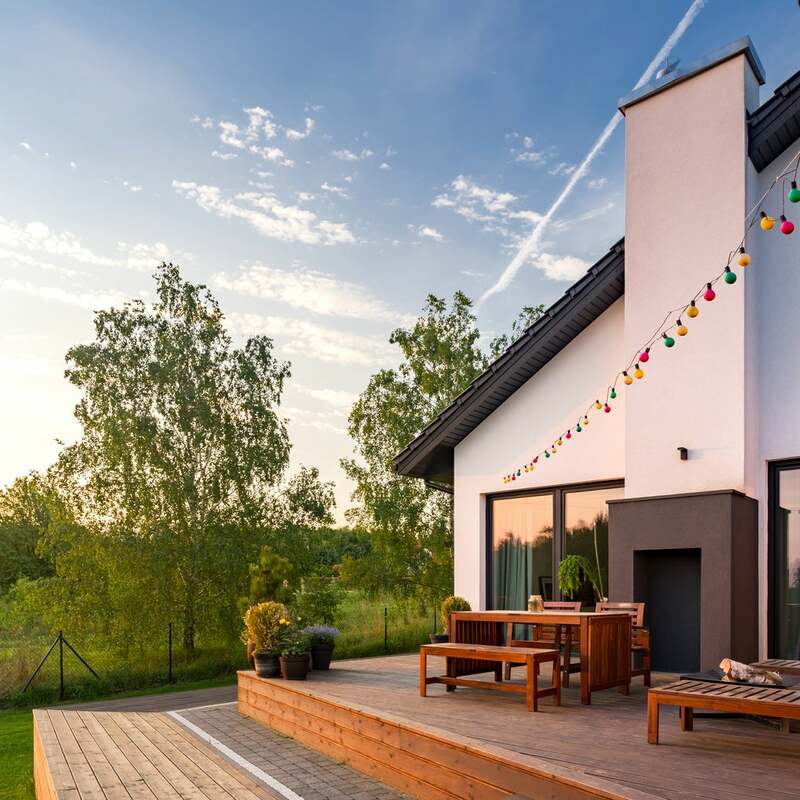 Outdoor decks are all-time-favorite spots for entertaining and relaxing, but like all exterior structures, decks eventually get dirty. Left that way, they’re sure to become old and weathered before their time. To keep your deck looking great, clean it annually—ideally, in spring or early summer—then follow up with a sealer to protect it. Commercial deck cleaners are readily available online and in home improvement centers, but for best results, be sure to choose one suited to your deck’s material. Keep reading to learn how to select the best deck cleaner, and why we pick the following for different types of decks and specific cleaning issues. Deck cleaners are designed to remove a host of eyesores—including grime, grease, stains, mold, and mildew—from different types of decks, so choose one specifically suited to both the decking material and the type of stain or debris. 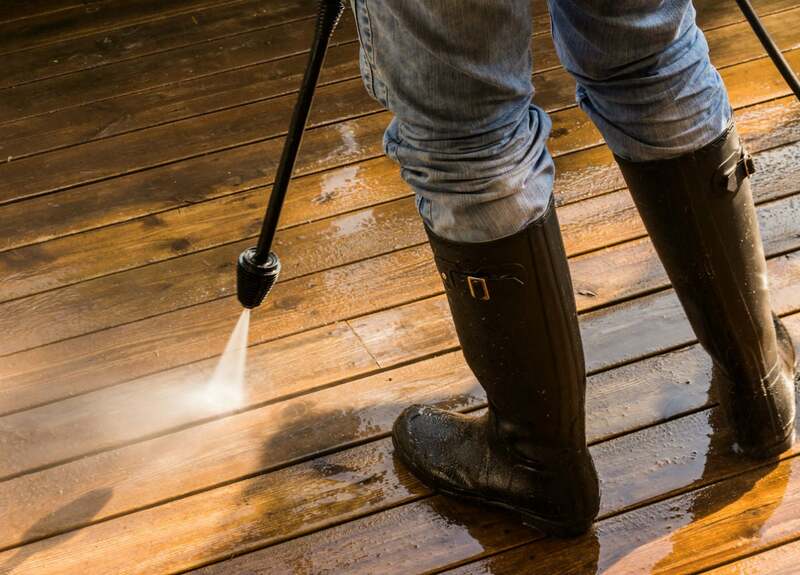 For dirty wood decks, choose an all-purpose wood deck cleaner. All-purpose wood deck cleaners contain detergents to dissolve surface dirt, spills, and grime. They’re available pre-mixed (apply right out of the container) or in concentrated crystal or liquid form (dilute with water before use). These cleaners are suitable for use on exterior-type woods, such as cedar, teak, or redwood, as well as wood decking that’s been pressure treated with alkaline copper quaternary (ACQ) or copper azole (CA). The cleaners are typically applied to the decking with a sprayer or deck brush, spread evenly with a mop, and then rinsed off with a garden hose. In some cases, additional scrubbing with a deck brush may be required to remove stubborn stains. For dull or weathered wood decks, choose a “brightening” or restorative cleaner. Even if they’ve been sealed, wood decks, especially cedar and redwood, eventually begin to dull and take on a weathered, gray appearance. Rusty streaks can also appear around screw heads or along the wood’s grain. If this describes your deck, purchase a cleaner advertised to “lighten” or “brighten.” Sometimes called restorative cleaners, these products contain bleach, oxalic acid, or oxygenated components, such as sodium percarbonate, which lighten the wood surface and fade stains. These cleaners are usually sprayed on, worked into the grain with a deck brush for even coverage, and then rinsed off with a garden hose. For mold and mildew, choose a cleaner with mildewcide. If you live in an area where rain is frequent, mold and/or mildew can grow on your wood deck. Left untreated, these fungi will thrive and eventually destroy the wood’s cellular structure, leading to rot and decay. At the first sign of mold (flat black or green spots) or mildew (grayish-white powdery-looking splotches) look for a cleaner containing mildewcide (available in a premixed formula or as liquid concentrate). Note that these cleaners should not be rinsed off. Leaving the solution on the wood allows ample time to kill the fungi and then seep into the deck’s surface to reduce the chance of mold or mildew growing again in the future. For composite decking, don’t use a wood deck cleaner—rather, choose one specialized for composite lumber. Composite decking is manufactured from wood byproducts and plastic, and it comes with an impermeable surface, designed to resist rotting and decay. Wood deck cleaners may be too harsh for composite decks, especially if they contain brightening ingredients, which can strip the sheen off decking, leaving a dull, unattractive look. A deck cleaner made specifically for composite lumber (available premixed or in concentrated liquid form) may contain surfactants, ingredients that leave a thin protective layer on the surface to help repel staining. Composite deck cleaners are typically sprayed on, brushed with a soft deck brush, and then rinsed off with a garden hose. For painted decks, use a gentle all-purpose cleaner without ammonia. Painted wood decks, often coordinated to match the trim on a home, come with special cleaning issues. Harsh cleaners can damage the painted surface, weakening it and leading to cracking and peeling. A gentle all-purpose deck cleaner that does not contain ammonia is the best choice for a painted wood deck. The label should specify the cleaner is safe for painted surfaces. The product may also contain surfactants to help stave off staining. Most painted deck cleaning products come premixed and should be sprayed or squirted on, mopped lightly to clean away dirt and grime, and then wiped dry with clean, soft rags. Premixed deck cleaners are the simplest to use: Just pour into a pump sprayer or a bucket and then spray on or apply with a deck brush. It costs $25 to $30 to clean a 1,000 square foot deck with a premixed product. Concentrated deck cleaners come in both powdered crystal and liquid form, and must be diluted with water before applying. They typically cost a less, running $10 to $15 to clean a 1,000 square foot deck. Concentrated liquid deck cleaners can also be used (undiluted) in the attached dispenser of a power washer (follow manufacturer directions for dilution rate settings). For great cleaning results, we’ve selected the following five deck cleaners as the best products on the market for most common deck types and their specific cleaning needs. If looking to restore a weathered wood deck to its original color, you won’t go wrong with the Woodrich Cleaner & Brightener Kit for Wood Decks. The kit comes with two powder products, which blend easily with water: a cleaner to be used first for removing grime and dirt, and a brightener, used second, for bleaching grayed wood. Both products can be sprayed on or applied with a deck brush, followed by rinsing with the garden hose. 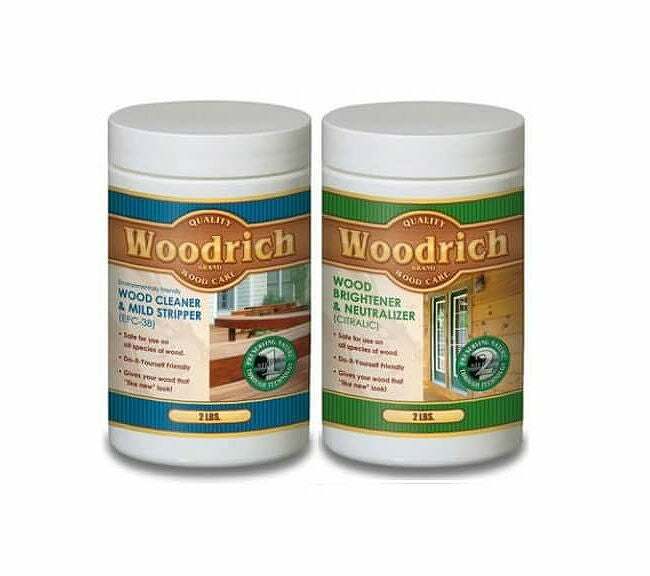 Amazon buyers give the Woodrich cleaner and brightening combo 4.6 out of five stars for superior brightening power. The kit treats decks up to 750 square feet. Available on Amazon. Clean and protect your composite deck with Resist Mist Composite Decking Cleaner and Sealer combo. The gentle all-purpose cleaner safely removes grease, dirt, and mildew, while the separate sealer, applied after cleaning, imparts a microscopic shield on the decking surface to help it resist future staining and fading from UV rays. 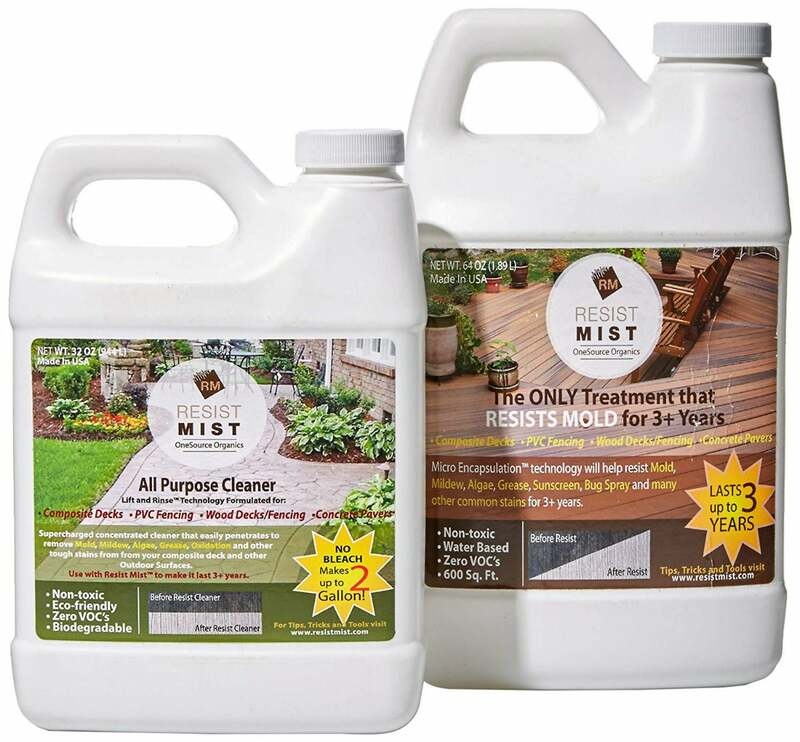 Resist Mist will treat decks up to 1,000 square feet, and Amazon buyers award it 4.8 stars for ease of use (no mixing necessary, just spray and rinse). Available from Amazon. Painted decks require a gentle cleaner, and Star Brite Non-Skid Deck Cleaner contains non-caustic chelating detergents to safely dissolve spills and dirt without scrubbing. 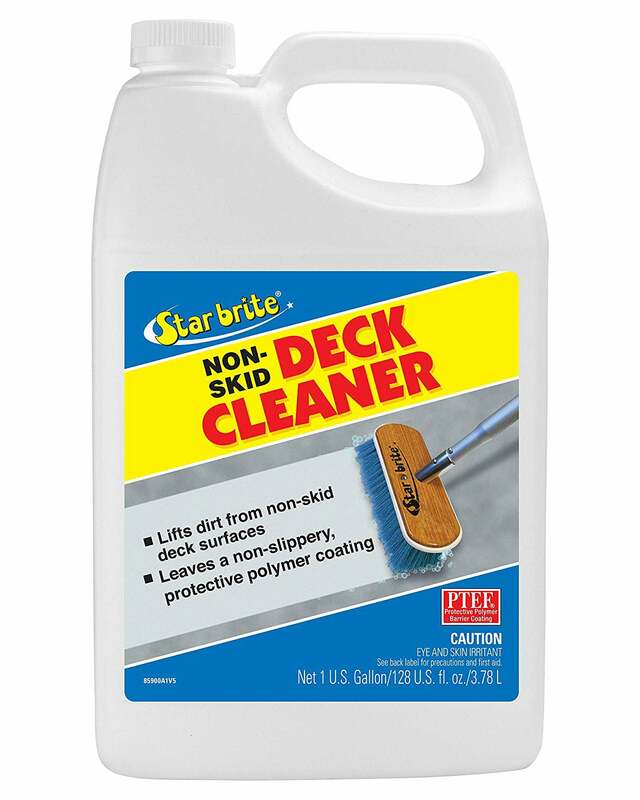 While Star Brite is manufactured as a deck cleaning product for boats, because it’s so gentle, it’s a great choice for painted home decks as well. It comes as a premixed liquid and can be applied to a wet painted deck with a pump sprayer or a soft deck brush, mopped over the surface, and then rinsed away. The cleaner also contains protective polymers that create a microscopic layer of protection to help repel stains and spills. Amazon buyers give the Star Brite cleaner 4.6 stars for effective cleaning without damage to the paint. One gallon cleans and treats a deck up to 1,000 square feet. Available on Amazon. 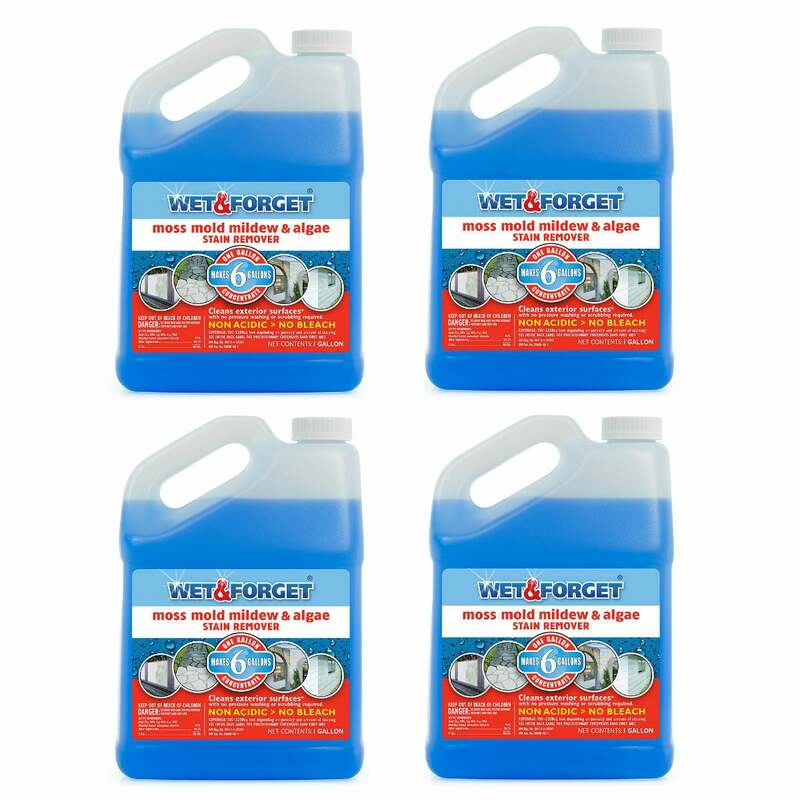 Banish mold and mildew with Wet-and-Forget Moss, Mold, and Mildew Cleaner, which earns 4.6 stars from Amazon shoppers. It comes in a liquid concentrate for mixing with water, and it can be applied with a pump sprayer, a deck brush, or a hose-end dispenser. Simply saturate the wood decking evenly and let it dry on its own—no scrubbing or even mopping required. Mildewcide in the solution will kill and remove any existing mold, and help prevent future mold, moss, and mildew growth. One gallon treats up to 2,250 square feet, it comes in a four-pack. Available on Amazon. 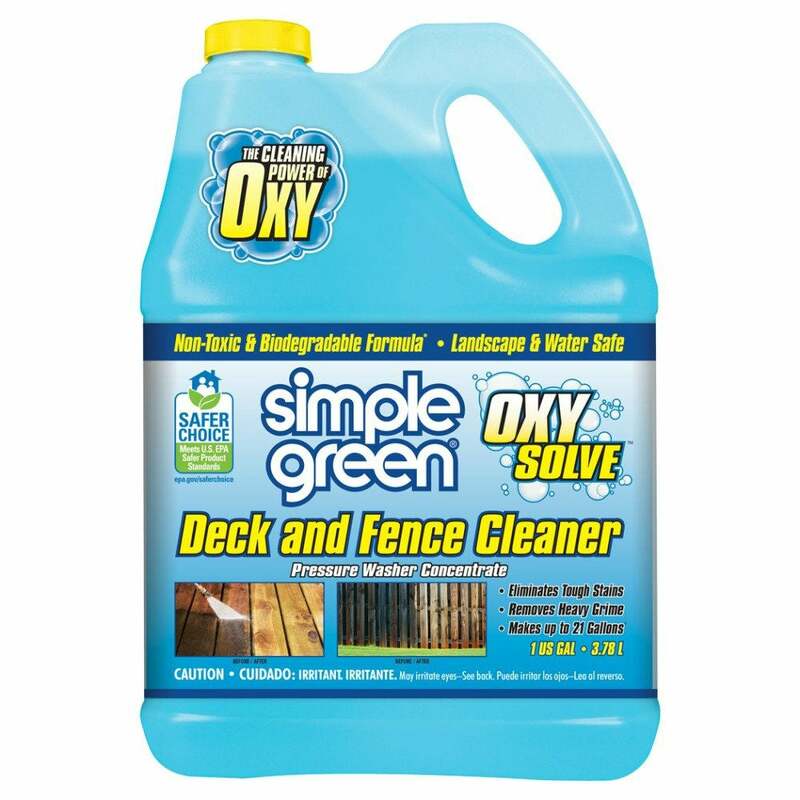 Concentrated and ready to use in your pressure washer’s dispensing reservoir, SIMPLE GREEN Oxy Solve Pressure Washer Cleaner is tough enough to remove stubborn spills and stains—even stuck-on tree sap! Happy Amazon buyers give the cleaner a resounding 4.8 stars for its ability to clean away spills, dirt, and discoloration. SIMPLE GREEN contains hydrogen peroxide to brighten wood decks while cleaning. One gallon of SIMPLE GREEN cleaner will clean up to 6,400 square feet, and it can be applied in a pump sprayer or with a soft deck brush. Available on Amazon.